What with (not) finishing Christmas cards, kids’ Christmas Concert, and general craziness, not a lot of sewing has gotten done this week (shocker, I know). However, I did manage to find a few moments (and I do mean few) to sew the side-seams and shoulder-seams of the coat together. I think this is one of the most magical moments in garment-making—when you go from two or three flat pieces of cloth into something you can actually try on. Setting in the sleeves is a close second, but I still think sewing the shoulder and side-seams tops it. 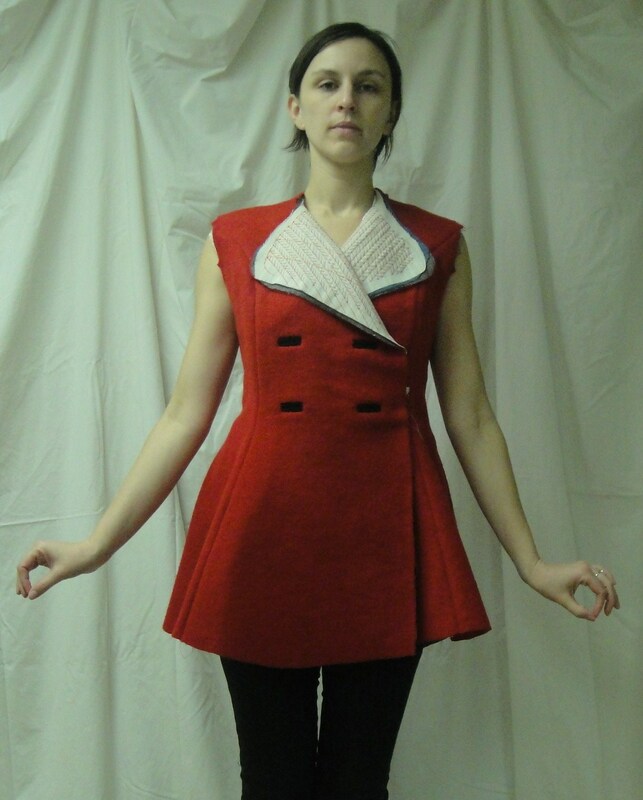 So here we go with some (ulp) fitting shots—unglamorous, no makeup, bed-head, and all. pieces (as per Gertie’s sewalong instructions) was way too stiff. 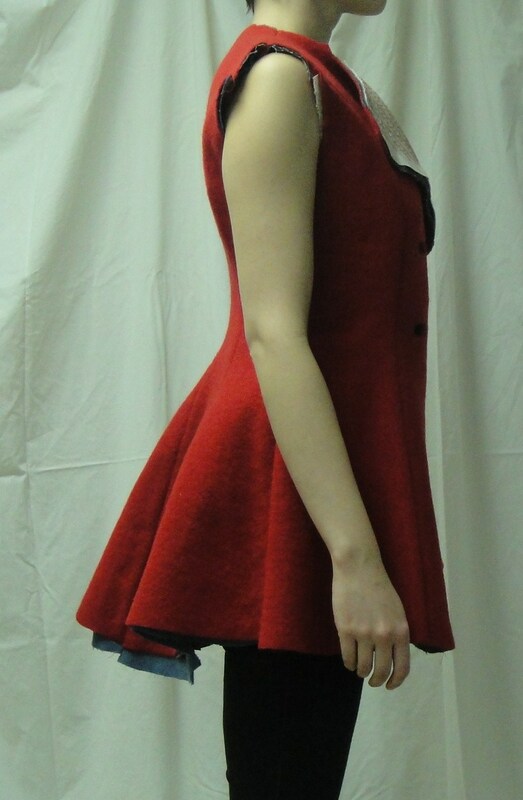 I don’t know if it’s just because my coat fabric is quite stiff to begin with, but it looked wooden, and was forcing the side-seam of the peplum back and making the excess flare at the back even worse. So I cut it out—everything below the waist on the front side piece, and curving down into a narrow front panel on the front piece. This helped a lot, though it’s still a bit stiffer in the front, as you can see (all these photos are from after I took it out). In the back view, you can see the gorgeous smoothness of the lower back, and still a bit of excess between the shoulder blades. Does this mean I have a narrow back (?!?) or just reflect the fact that I used a size larger pattern? No idea, although I guess next time I tackle a Colette, I’ll make the 0 and just do whatever brutal, soul-destroying alterations I’ll need to the waist. I’m not sure if I want to bother fixing it or not—I think I’ll wait until I get the sleeves on and some shoulder pads in to decide. The main thing holding me back is that I already catchstitched down the seam-allowances in this area. From the rear it looks like there might be a little extra length at the back hem, although I’ll have to trim it smooth (joys of a knit) and then check again. Can you guess what I forgot to do when I stitched up the side seams? That extra fabric between the shoulder-blades, I bet you won’t notice it if you wear a knitted jumper/layers underneath for warmth? This is coming along nicely. Yea, the hair canvas can add some serious stiffness. 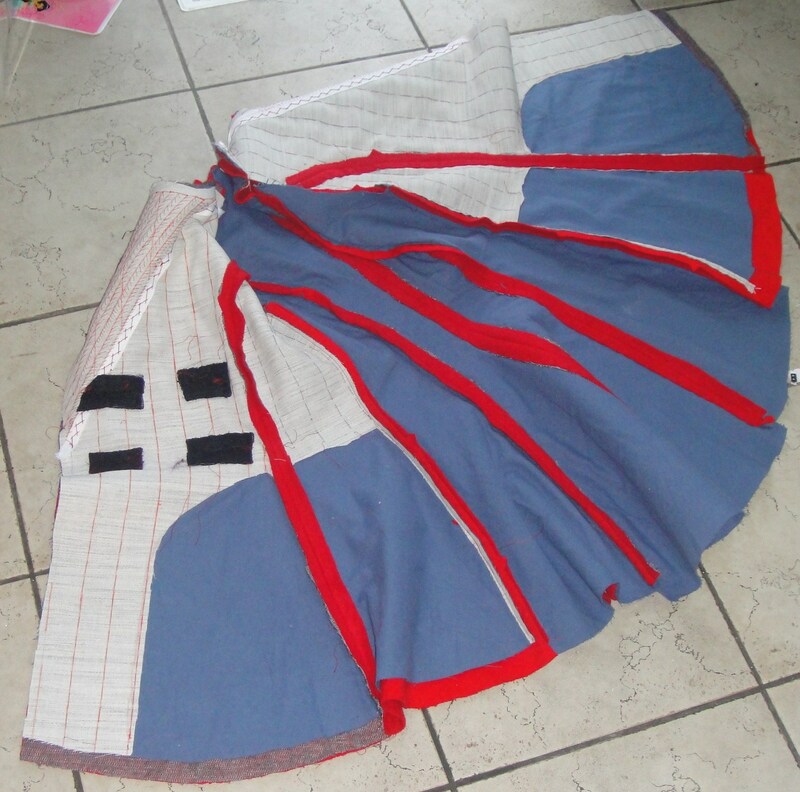 I have to cut it out from the seams and leave the rest go to reduce bulk. Looking good. I think its looking pretty darn good! I agree with this stage, it’s like the flat pieces suddenly have dimension, develop a personality of sorts. Speaking of personality, you make the sewing process humorous, love the comments. I think it looks great so far!! Love the color…..
Ok, it looks GREAT! Really nice. I like how you raised the roll line. Also, that was genius to take out the hair canvas in the front. I also noticed a huge difference in the front and back peplum because the stiffness of the hair canvas but I never thought of taking it out- duh! Instead I basted hair canvas to my back pieces, too, to make it hang the same way. 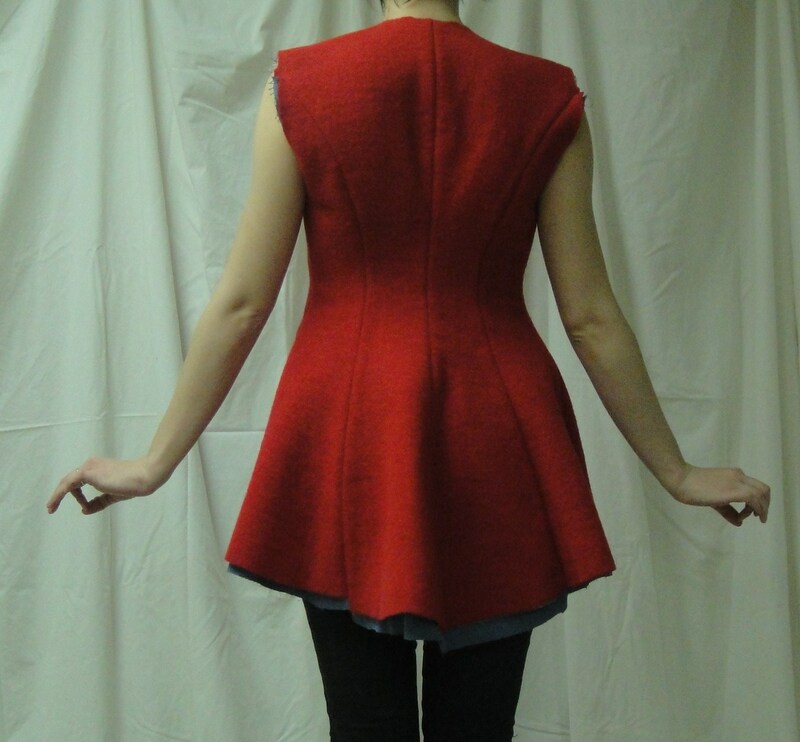 My peplum is super exaggerated now. I’m excited to see it finished! I agree with Claire, that the back will probably look fine when you’re wearing layers. You will need that bit of ease between the shoulder blades. After all, with the sleeves on, you may still want to be able to move your arms (even forward!). To be honest, I come across a lot of posts about fitting on blogs, which talk about taking out all excess width. To me, that’s absolutely ‘not done’. Most garments need a bit of ease. I agree with not fixing the back at the shoulder. You might want that ease when you are wearing sweaters underneath. Your coat is coming out really well. The middle back? Probably nothing. You’re trying a coat on over it looks like nothing but underwear, there’s no way you can tell anything. Unless you’re going to be wearing it to go flashing :-), you should be trying it on over whatever the most you’re likely to wear under it. Oh yah you need the pockets. Where else will you keep your lipgloss?! I had to tack my pockets to keep them from hanging down. Let me know if you have similar issues. It’s looking very cool! The back looks lovely and I quite like how the hem dips slightly lower. I’m going against the grain – I would want to remove some of that excess between the shoulder blades . It looks like the CB seam needs a small amount shaved off the curve here – the lighting could be making it look worse than what it actually is though! I would reassess it after you have your sleeves on, and if you can still raise your arms and brush your hair easily, take it in slightly, it might only need 3mm but it will make a difference! Can’t wait to see the finished item! I think it looks fantastic as is! It’s far too easy to become too critical of our own work. When you get the coat finished, I doubt there will be as much play. Even if there is, it still looks good – and that’s the important point, isn’t it? I think it looks gorgeous and the back fits you great! I love the jacket! Maybe I could have one too, someday. About Edwardian skirts. Remember the walking-skirt pattern from Folkwear, that I made in full-length in brown twill, and in mid-calf length in medium-green twillish fabric. The one with the flat gored front and the gathered back gores. I could try to send you a copy, if you like. It might work with that jacket.